GStreamer encountered a general supporting library error. Launchpad couldn't import bug #614679 from GNOME Bug Tracker. ** Message: Error: GStreamer encountered a general supporting library error. I can confirm this bug on 9.10 (64bit) and 10.04 beta1 (32bit) too. YouTube seems to have changed their site just recently and globally broke the totem YouTube plug-in on both, my Karmic box and my Lucid virtual machine. As this plug-in is installed by default on Lucid, this should either be fixed before final release or moved from the totem-plugins to the totem-plugins-extras package (which is not installed by default) and fixed later. Ps. Pretty sure it's not a library issue. The plug-in was not touched since 5 months on my host system and worked only a few days ago, but drops the error now. I get the same error, since today no video seems to work anymore. Before, there where only a few which brought up that error message. I used to be able to watch YouTube on Totem, then a while back started getting the odd video with "GStreamer encountered a general supporting library error." error. Now they all seem to give that error. Just Googling around, it looks like a YouTube server side change? This occurs for me as well. Hello, this has error occurred on my and also my brother's PC. I use Totem 2.32.0 and GStreamer 0.10.30, Ubuntu 10.10 with latest update. While playing video from YouTube through Totem plugin. ** Message: Error: V GStreamer došlo k chybě obecné podpůrné knihovny. 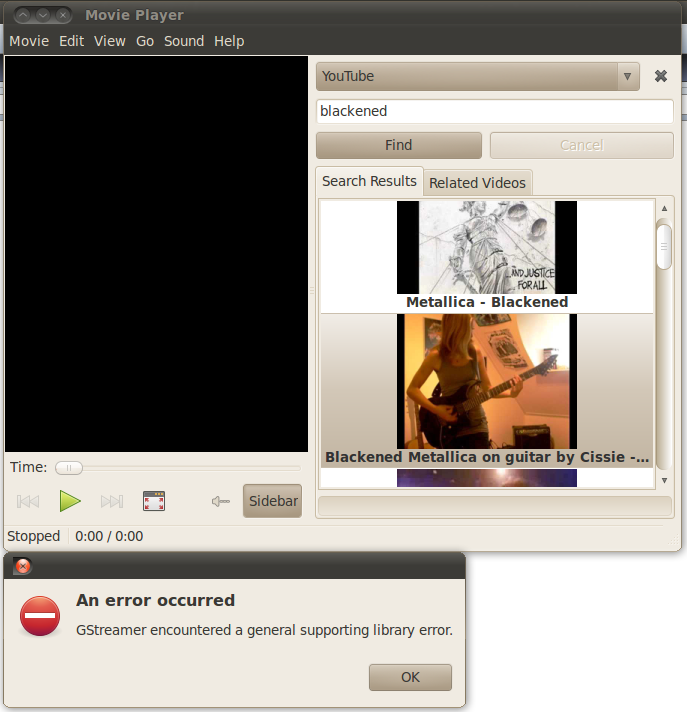 ** Message: Error: GStreamer ha incontrato un errore generico nelle librerie di supporto. It seems that youtube has updated the site and consequently the plugin does not work anymore. I use ubuntu 10.10 64 bit version all updated. Yes same for me, on both 10.10 amd64 and 10.04 32bit. I got the same problem, it says: "GStreamer encountered a general supporting library error." Using Ubuntu 10.10 all latest updates. I'm quite new, i see it says "fix released" here but i cannot find it, does that mean its in the update database or w.e? Or is this problem not fixed yet? The problem returns every time Google changes its mind about the YouTube API. maybe recent totem(2.32.2)ubuntu 11.04 also failed to fix GStreamer error. same here, totem 2.32.0, gstreamer 0.10.30 on maverick i686. way to go, youtube. generico nelle librerie di supporto. If I read these posts correctly, there is no fix at this time (April, 2012), correct?